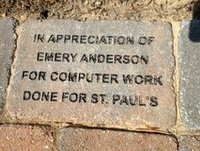 The St. Paul’s Vestry is offering an opportunity for parishioners to honor their families and friends with a permanently engraved Memorial Paver in the Circle, across from the main entrance to the church. The memorial pavers will line the existing pathway in the garden. Each of the rectangular pavers (9.25 x 6″) can hold up to four lines of text with a possible maximum of 20 characters on each line. The price of a paver is $125, enough to cover the cost of the paver and the engraving. (NOTE: In 2015, the price of the paver increased to $125 due to an increase in the cost of engraving.) These pavers make wonderful gifts that will last for many, many years. For more information, please contact Jeff Kager at KagerClan@aol.com. Memorial Paver engraving forms are available in the narthex or by clicking the link below.